With the permission and blessing of the Asimov estate, three of today's bestselling SF writers, Gregory Benford, Greg Bear and David Brin, have conspired to complete the epic saga the beloved Grand Master left unfinished. 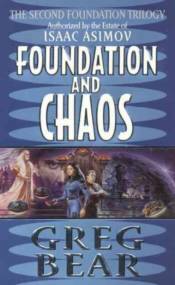 The Second Foundation Trilogy continues with Greg Bear's Foundation and Chaos, the gripping new novel about a galaxy-wide power struggle within the ranks of the robots that have served and protected humankind for 20 centuries. Hari Seldon, frail and full of years, is on trial for daring to predict the Empire's fall, and the time has come for the long-anticipated migration to Star's End. But R. Daneel Olivaw, the brilliant robot entrusted with this great mission, has discovered a potential enemy, even deadlier than the figurehead Emperor's brutal minions. Humaniform robot Lodovik Trema is the only survivor of a bizarre insterstellar accident. Exposed to a neutrino storm, his positronic brain has apparently erased the holographic template of the Three Laws of Robotics. If this is true, Lodovic's service to humankind is no longer a question of destiny, but of will, and therefore, no longer absolute. Daneel needs Lodovic, so he sends him to Eos, the legendary secret planet where the robots perfect their service to humankind. And Lodovic says he is healed. Yet, can he be trusted, when stirrings of discontent are arising all over the galaxy? Other robots are questioning their mission and Daneel's strategy. And humans, too. Hidden in the steel caves of Trantor, sought by loyalist and rebel alike, is an obscure heatsink worker's daughter, a girl whose amazing mental powers are also the result of disaster: the deadly human malady known as Brain Fever. Young Klia Asgar's awesome but unwanted psychic abilities promise to join man and robot in a common destiny or a mutual destruction.